To Cite: Jalali G, Hami M, Namaee N, Salehi M, Mojahedi M J, et al. Relationship Between Vitamin D Deficiency and Metabolic Syndrome in Renal Transplant Patients in Mashhad, Iran, Shiraz E-Med J. 2017 ; 18(3):e40985. doi: 10.5812/semj40985. Background: Vitamin D is a lipophilic hormone that affects homeostasis of calcium and phosphorus. Recent studies have shown that vitamin D deficiency may be a risk factor for metabolic syndrome (MS). Also, metabolic syndrome is highly prevalent in renal transplant patients and it can be associated with graft survival reduction. Objectives: This study aimed at investigating the relationship between vitamin D deficiency and MS in renal transplant patients. Methods: This cross-sectional study was performed on 86 stable renal transplant patients in warm seasons of 2014. Metabolic syndrome was diagnosed using the modified Asian adult treatment panel III (ATP III) criteria. Patients were classified based on their serum 25-hydroxy vitamin D levels: normal (> 30 ng/mL), insufficiency (16 - 30 ng/mL), and deficiency (< 16 ng/mL). Patients with a history of the malabsorption syndrome, alcoholism, taking vitamin D supplementations in the last 2 months, pretransplant diabetes mellitus, and pregnancy were excluded from the study. Results: Fifty percent of the patients had MS, consisting of 48 males (55.8%) and 38 females (44.2%). The mean age of the MS group was significantly higher than the non-MS group. The body mass index in the MS group was significantly higher than the non-MS group (P = 0.001). The mean serum vitamin D level in the MS group was lower, but this difference was not significant (P = 0.914). Conclusions: Although the serum vitamin D level was lower in MS patients, it was not significant. Also, due to the high prevalence of both MS and vitamin D deficiency among renal transplant patients, we did not find any significant relation between vitamin D deficiency and MS.
Actually obesity and metabolic syndrome (MS) account global problems which are growing and without a doubt, this growth plays a major role in increasing the mortality rate (1). Metabolic syndrome is a label for a group of risk factors that raise the risk of cardiovascular disease, and include hypertension, dyslipidemia, truncal obesity and impaired glucose tolerance (2). Vitamin D is a well-known lipophilic hormone with major impacts not only on homeostasis of calcium and phosphorus, but also on the entire body. Evidence suggests that adequate levels of vitamin D may have protective effects against the development of MS (3-6). It seems that vitamin D deficiency lowers the intracellular level of calcium and thereby can reduce the level of insulin secretion by beta cells and consequently the impaired glucose tolerance (7). Gagon et al. suggested that patients with vitamin D deficiency have a higher waist circumference (WC), fasting glucose, triglyceride level and insulin resistance (HOMA-IR). According to their study, patients who had vitamin D levels of lower than 24 ng/mL were most likely to develop MS (8). In a prospective study performed in Saudi Arabia, addition of vitamin D and increased exposure to sunlight caused reduction of MS from 25% to 13% (9). It is also reported that MS is more prevalent in renal transplant recipients than general population (10), this can be due to the effect of immunosuppressive drugs such as tacrolimus and corticosteroids (11). As vitamin D deficiency is common in renal transplant recipients in our city; so, we tried to find the relationship between MS and the serum vitamin D level in our patients. This cross-sectional study was conducted between February 2014 and May 2015. A total of 158 renal transplant recipients from the outpatient transplant clinics at the Montaserieh Hospital of Mashhad University of Medical Sciences were evaluated. The inclusion criteria included age more than 18 years, the kidney transplantation period at least six months, stable graft function (the serum creatinine level less than 2 mg/dL) in last three months. Patients with pretransplant diabetes mellitus and posttransplant diabetes mellitus, overt infection, those who taking immunosuppressive drugs of the target organ inhibitor group as rapamycin (sirolimus), and patients with a history of the malabsorption syndrome, chronic diarrhea, ileostomy, alcoholism, and pregnancy were excluded. Also, patients who had taken oral vitamin D in two months prior to evaluation or had vitamin D injections or antiseizure drugs were excluded from the study. Finally, 86 patients (48 males and 38 females) entered to the study. All recipients were on triple immunosuppressive therapy with tacrolimus or cyclosporine, azathioprine or mycophenolatemofetil or mycophenolic acid and prednisolone. Because all were more than six months posttransplant, they were taking the maintenance dose of steroids (2.5 - 5 mg/day of prednisolone). All patients gave informed consent for participation in the study, which had already been approved by the ethical review board of Mashhad University of Medical Sciences. Transplant recipients were stratified into two categories with/without MS by the modified national cholesterol education program-adult treatment panel III (NCEP-ATP III) criteria for Asians (Iranian modified): serum TG > 150 mg/dL or specific treatment for this lipid abnormality, serum HDL < 40 mg/dL in men or < 50 mg/dL in women or specific treatment for this lipid abnormality, systolic blood pressure (SBP) ≥ 130 mmHg and diastolic blood pressure (DBP) ≥ 85 mmHg or use of antihypertensive medication, fasting blood sugar (FBS) > 100 mg/dL or use of antidiabetic medication, and waist girth ≥ 92 cm in both gender. Patients who had 3 or more risk factors were considered as the MS group and remainder who had 2 or less risk factor were categorized as not having MS (the non-MS group). Blood pressure was measured on the right arm after five minutes of rest in a sitting position. It was reported that the average of two measurements was taken at 5-minute intervals. Hypertension was defined by taking antihypertensive drugs and/or SBP more than 130 mmHg or DBP more than 85 mmHg. The body mass index (BMI) was calculated by the formula weight/height2 in kg/m2. The waist circumference was measured midway between the iliac crest and costal margins. Patients after a 12-hour fasting were admitted to get the blood sample to check serum creatinine, triglycerides, HDL cholesterol and plasma glucose concentrations. Fasting plasma glucose was measured by the glucose oxidase method (Human, Germany) with an interassay precision of 1.3% and intra-assay precision of 2.2%. The cholesterol level was measured by the enzymatic method with an interassay precision of 2.3% and intra-assay precision of 2.5%. Also, triglycerides and HDL were measured by the enzymatic method with an interassay precision of 2% and intra-assay precision of 3.5% using the Pars-Azmoon kit (Parsazmoon, Karaj, Iran). Low-density lipoprotein (LDL) was calculated by the Friedewald formula (LDL=total cholesterol- (HDL TG/5). Serum 25-hydroxyvitamin (OH) D was measured by radioimmunoassay (Biosource, Europe, Nivelles, Belgium). Serum vitamin D deficiency was defined if it was less than 20 ng/mL, serum vitmin D insufficiency was defined if it was between 20 to 30 ng/mL. Interassay and intra-assay precisions were 8% and 10%, respectively. 1) The research followed the tenets of the declaration of Helsinki; 2) the nature of the study was explained to the participants and written informed consents were obtained from them. They were free to leave the study at any time and 3) the research was approved by the ethical committee of Mashhad University of Medical Sciences, Mashhad, Iran. The data were entered in the SPSS software (version 16.0). All data were presented as the mean ± SD. The criteria defined for the MS were used to divide the patients into two groups and then comparison between the two groups was performed. The t test and the analysis of variance (ANOVA) were used to assess normally distributed variables. Qualitative and categorical variables were analyzed by the Chi-square test. In all statistical analyses, P < 0.05 was considered as the level of significance. Using the modified (Asian) NCEP ATP III criteria, 43 (50%) of 86 patients had MS. Demographic and transplant characteristics of the patients with and without MS were shown in Table 1. As it is shown, the mean age of the MS-group was higher than the non-MS group (P = 0.03), and BMI of the patients with MS was significantly more than the non-MS patients (P = 0.001). Other factors such as gender, type of donor, dialysis duration, and graft function were similar in both groups (P > 0.05). Abbreviations: BMI, body mass index; e GFR, estimated glomerular filtration rate; F, female; M, male; MS, metabolic syndrome. Comparison between the components of the MS criteria in the both patient groups were shown in Table 2. There were significant differences between serum TG and waist circumference in the two groups. However, no significant difference was found in other factors. It can be explained by the MS criteria definition that those patients who were on antilipidemic or antihypertensive drugs got to account to have these risk factors, besides the serum lipid level and blood pressure were in normal range and the differences were not significant. It should be noted that 58 (67.4%) and 26 patients (30.2%) who were treated for their hypertension and hyperlipidemia respectively, also considered as a risk factor of MS.
Abbreviations: Dia BP, diastolic blood pressure; FBS, fasting blood sugar; HDL, high-density lipoproteins; Sys BP, systolic blood pressure; TG, triglyceride. 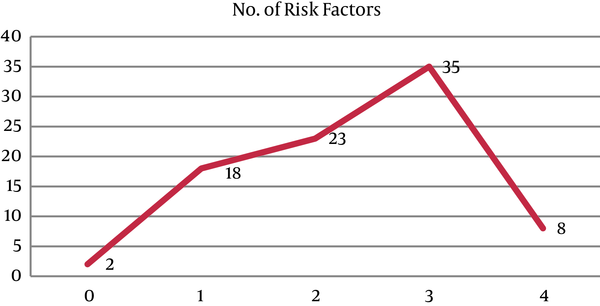 The frequency of risk factors of the Asian NCEP ATP III criteria in our patients was shown in Figure 1. Evaluation of the serum vitamin D level in patients showed that the mean serum level of vitamin D in the MS and non-MS groups were 21.28 ± 16.87 ng/mL and 20.90 ± 15.59 ng/mL, respectively (P = 0.914). Although in the case of vitamin D deficiency, there was a significant difference between the genders in the group with MS, which it was more common in women than men (P = 0.044), we did not find similar results in the non-MS group (P = 0.928) (Table 3). Totally, 81.4% of the patients had vitamin D deficiency or insufficiency and 18.6% had a normal serum level in both MS and non-MS. The mean serum vitamin D levels were compared in living donor and deceased donor kidney transplant recipients, there was no significant difference between them (living donor 22.78 ± 17.02 ng/mL vs. deceased donor 19.63 ± 15.39 ng/mL, (P = 0.828). Also, there was no significant correlation between serum vitamin D levels and frequency of kidney transplantation (first [n = 82], 21.25 ± 16.5 ng/mL vs twice [n = 4], 17.98 ± 4.69 ng/mL, P = 0.305). Moreover, the type of dialysis had an effect on vitamin D levels ([HD = 84, 21.47 ± 16.16 ng/mL], versus [PD = 2, 5.40 ± 0.84 ng/mL]) (P = 0.001). Afterwards, we investigated the relationship between serum vitamin D levels and anthropometric parameters. This analysis showed no significant positive association between the serum vitamin D level and BMI, (P = 0.268) (Figure 2), and waist circumference (P = 0.728) (Figure 3). The results of the correlation between the vitamin D and cardiometabolic risk factors showed that serum vitamin D levels correlated positively with FBS, LDL, serum uric acid level, duration of dialysis, and waist circumference, and negatively with age, serum TG, and blood pressure, but these correlations were not statistically significant (Table 4). Figure 2. 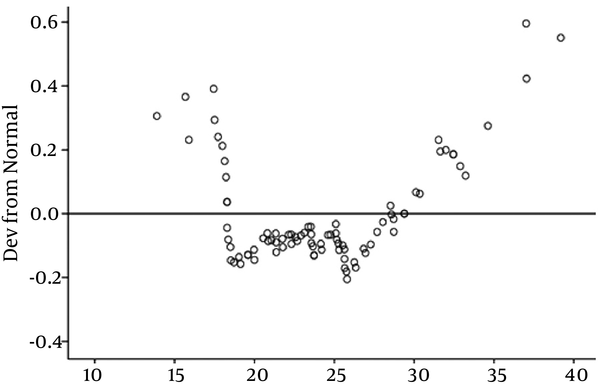 Correlation Between Vitamin D and BMI that was Normally Distributed. Figure 3. 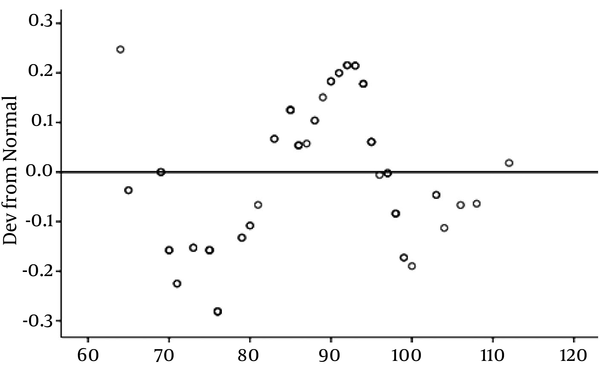 Correlation Between Vitamin D and Waist Circumference that was Normally Distributed. Abbreviations: BMI, body mass index; Dia BP, diastolic blood pressure; FBS, fasting blood sugar; Sys BP, systolic blood pressure; TG, triglyceride; WC, waist circumference. Furthermore, there was no correlation between a higher serum vitamin D and more risk factors of MS, as serum vitamin d levels in zero, one, two, three, or more components of the MS according to the modified ATP III criteria were 20.45 ± 11.95, 20.37 ± 11.66, 21.36 ± 18.77, 22.46 ± 17.91, and 16.14 ± 10.66, respectively (P = 0.90). The prevalence of MS in the general population varies widely among ethnic backgrounds and also according to the system to define it. It seems that proportion of people with MS is growing totally, because of increase in obesity and aging in population in last decades (12, 13). In Europe, the prevalence of the MS in general population varies from 15% to 45%, among these countries, Greece and Finland had the greatest proportions of MS, which the estimated incidence rates of this syndrome were 41.8% and 37%, respectively (14). In North America, between 1988 and 1994, about one-fourth of the population had MS by the original NCEP criteria. In South America, evaluation of MS by the NCEP criteria showed that Brazil with 53% had the highest prevalence; however, in this study, they used the NCEP criteria modified for Asian. Their reason for this selection was huge immigration of Japanese there (15). Lower prevalence rates have been reported in East Asian countries, between 10% and 15% (16). Prevalence of MS in Tehran (Iran) population was 30.1% using the original NCEP criteria. Based on this study, the prevalence increased with age in both sexes (17). It seems that MS is more prevalent in Iran than south-east Asia. Some reports suggested that MS is more prevalent in renal transplant recipients as compared to the general population (18). By using the modified Asian NCEP-ATP III criteria in Chinese people, the prevalence of MS was 15.1% and 32% in general population and renal transplant recipients, respectively (19). Elahi et al. revealed similar results in Pakistan (Karachi), 35.2% and 43.5% by the modified Asian NCEP-ATP III criteria, respectively (2). Based on our study in the Montaserieh transplant center in Mashhad, the prevalence of MS in renal transplant recipients was 49.1% (20). In Europe, the incidence of the MS in kidney transplant recipients is 43% to 59%, depending on the defining system (18) as previous studies; the results are showing a higher prevalence of MS by the original NCEP-ATP III criteria in renal transplant recipients in European people as well. Australian kidney transplant recipients (50%) had MS by applying the original NCEP ATP III criteria (21). Vitamin D deficiency is a common problem in today's societies and this deficiency is more common in renal transplant recipients (22). Vitamin D could be absorbed not only through food but also via synthesis in the skin (mediated by ultraviolet radiation). In this group of patients, vitamin D deficiency could be more severe due to reduced exposure to sunlight, which alleviates increased risk of skin cancer in them, and also dietary restrictions that reduce the natural absorption of vitamin D through digestive system (23, 24). An immunosuppressive medication like glucocorticoids also activates the genes involved with the vitamin D catabolism enzyme expressions and therefore exacerbates this deficiency (25). Different studies have proposed different definitions for vitamin D deficiency. A multitude of studies have reported that the adequate levels of vitamin D are between 25 and 32 ng/mL. In the serum vitamin D level greater than 40 ng/mL, its activity becomes maximal. A study on dialysis patients has found that there was no radiographic evidence of vitamin D deficiency on subperiosteal dissolution in any of the patients with serum levels higher than 40 ng/mL (26). Taziki et al. conducted a study in Iranian population and they found a high prevalence of vitamin D deficiency in renal transplant patients (93.5%) that was similar to its level in general population (89.1%) (27). These results are consistent with ours. Also, another study in renal transplant recipients in US showed that patients with MS had a lower serum level of 25(OH) D3 and adiponectin (11). Kulshrestha et al. reported that vitamin D deficiency and insufficiency are common in both the general and kidney transplant population and are associated with an increased risk of diabetes mellitus, cardiovascular diseases and MS (11). Gagnon et al. showed that in Australian adults, the lower 25(OH)D was associated with increased risk of MS, and insulin resistance over a 5-year period (8). They reported inverse relationship between the serum vitamin D level and MS components such as WC, serum TG, FBS and insulin resistance that measured by HOMA2-IR. The mean values of the vitamin D level in both groups with and without MS in Australian people were 25 ± 9 ng/mL vs. 27 ± 10 ng/mL, respectively and the difference was significant (P < 0.0001). We also found that older and more obese patients had more MS as their BMI and WC were higher significantly. However, there was no significant correlation between vitamin D levels and MS components. It may be due to small population in our study. In our study, 81.4% of renal transplant patients had some degree of vitamin D deficiency (< 30ng/mL), which is consistent with 80% prevalence reported by Ewers (< 30 ng/mL). However, the comparison of results obtained for the two groups of with and without MS showed no significant difference between these groups. It may be due to the high prevalence of vitamin deficiency in general population and so in renal transplant recipients at all. Totally, based on a review article on 2015, it seems that there is a relationship between the serum vitamin D level and insulin resistance and MS, but data are insufficient and more studies are needed to confirm it (28). Due to the high prevalence of both MS and vitamin D deficiency among renal transplant patients, we did not find any relation between them. Although the serum vitamin D level was lower in MS patients, it was not significant. May be in a larger sample size it could be obvious. There are some limitations in our study, including a relatively small sample size and also study design was cross-sectional and did not address the cause-effect relationship between the serum vitamin D and MS. Further prospective studies in different ethnic groups with a higher sample size could help to find association of serum vitamin D with MS and its cardiovascular complications. Frequent vitamin D deficiency in our patients leads to lack of finding an association between the serum vitamin D level and MS. Strengths of study: We found that vitamin D deficiency is very common in our transplant recipients, and thus the bone disease is also prevalent in this group of patients that may lead to morbidity. So, early diagnosis and treatment of vitamin D deficiency can help them in prevention of bone disease and MS. Conflicts of Interest: The authors declared no competing interests. Funding/Support: This paper was issued from the thesis of Ghasem Jalali and financially supported by the research vice-chancellor of Mashhad University of Medical Sciences.